I run a Good Food Club – which is essentially a monthly buying club from our home in Cape Town. We facilitate Farm-to-Table style living by supporting, for the most part, local, sustainable, natural/organic style small businesses. We have the most incredible families who participate in this club. With over 800 products available to purchase, we have so many different styles and intentions when shopping. From hormone free meat, to grass fed farm butter, to chemical free cleaning detergents and menstrual cups. 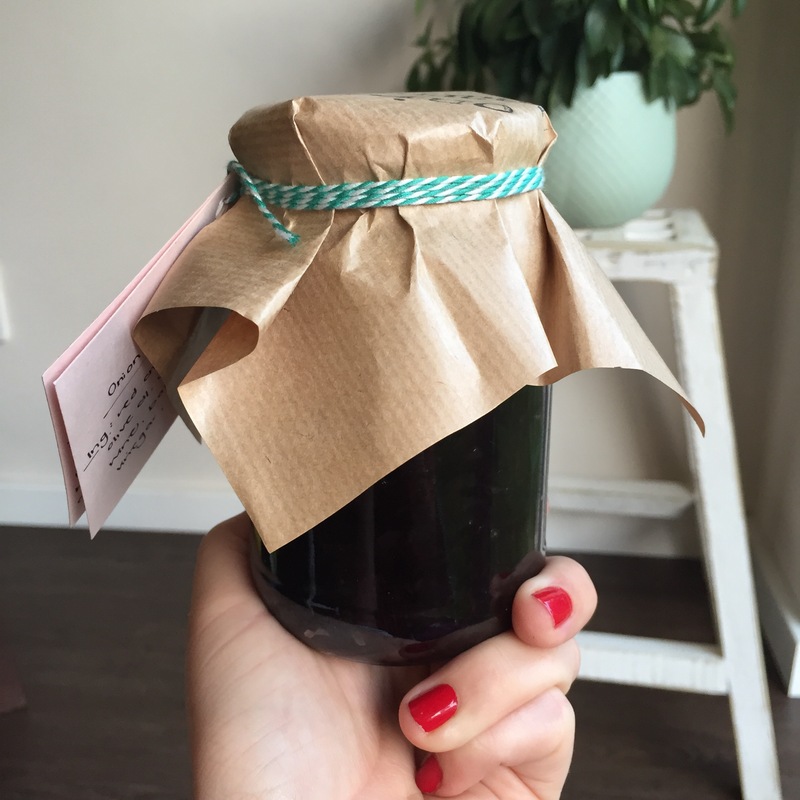 Last month I asked my members to share what they loved buying from the Good Food Club and why… and this was what I received back. So you know I’ve always been a greenie right? It’s pretty much the reason I started the GFC. Butter, Eggs, Swiss Cellar – pickled onions and jams (once you start, you LITERALLY can’t stop), strawberry yoghurt, mozzarella cheese (for pizzas). Cake flour (we make a lot of pancakes and pizza bases), beef mince, mango strips (my absolute spoil), oh mega peanut butter, and my (fantastic!) new wellness doc really recommends Superfoods’ Super Thrive Women. We eat the chicken burgers once a week, as well as boerewors for braais, and nachos with the corn chips. Another spoil is the (chocolate and) hot chocolate from cocoafair (YUM!). We buy 5 packs of salami and freeze them, and take them out when needed. It is THE most delicious salami I’ve ever tasted. I always buy frozen blueberries, strawberries and plain yoghurt for smoothies. The honey is a must, I love the spices (mainly cinnamon and cumin) and Eikelaan & Metro Organics fresh produce! I try get my hands on as much organic fresh produce as possible. I also buy the salmon now (due to Cara’s influence) and eat it with my 2 year old to get some good omegas into her. A few other favourites: fresh organic coriander, quinoa, dates and raisins (for lunch boxes), halloumi spring rolls (YUM!) and 1kg cashew nuts when I’m feeling flush. Body products: Love the Pure Beginnings range for us all, the natural deo (is incredible!) and I cannot CANNOT recommend the menstrual cup enough. If you’ve ever thought about buying one, DO it. I love buying the angelfish for Jamie Oliver’s FISH PIE. It’s full of good things like carrots, spinach and boiled eggs (weird I know, but it works) and if you don’t want to use double cream you can use double cream yoghurt instead. Salmon offcuts: I use it often in pastas and with scrambled eggs or on a sandwich with cream cheese and cucumber. I also do the venison-droewors-in-the-freezer-trick for lunch boxes. It defrosts super quickly though so I keep it in the freezer and just take out little bits each evening when I make the boys’ lunch. I do a yum meal with the pork fillet. I make a chutney by frying a diced onion, a clove or two of crushed garlic, thyme and some grated apple then smoothing that onto puff pastry. Searing the fillet in the pan and then placing that into the pastry and baking it for about 30 minutes. A delicious meal! The strawberry JAM! I am never going back. It is to die for. Also a big thumbs up to the raw creamed honey, one of my faves. I love a spoon in a banana smoothie or on toast. A little treat is the edible flowers. I add them into ice cube trays to make interesting ice or top baked goods with them. For Harry’s dedication tea I even added them on top of sandwiches. The frozen berries which are so extremely well priced are used in smoothies, Harry’s fruit purees and in muffins or cakes. At Christmas I made a big sorbet with them. I really love the halloumi. I fry slices in lemon juice and place on top of vegetable pastas (I try make meatless meals at least twice a week) or eat as a snack. The eggs and venison mince are also well priced and make many good healthy meals with those good proteins. I have recently started buying the boerewors and pork sausages (both delicious!) and make a sausage pie with them or use them for bangers and bash otherwise boerie rolls. I used the lamb stew meat last night in a tomato bredie – oh my yum – but am definitely keen to try the chuck stewing meat next time. I love the venison mince. My two favorite dishes are Keftedes with Tzatziki (Jono makes the most amazing greek yoghurt that we use for this) and the other dish I use it for is a venison mousaka. If we need a quick and easy dinner I make a halloumi cheese salad and throw in a generous amount of blueberries too. Bring to the boil, and then let simmer on lowest heat for 1-2 hours (depending on how hungry I am). Stir regularly and add more water/wine if liquid boils off. Before serving, add beef stock and let simmer for 10 minutes. Chuck stewing is great for beef bourginon, tomato bredie, wraps with warm veg and hummus. It also goes quite far if you use a tomato base and add veg/beans etc. Mince – I buy 2kgs and then make bulk meatballs and freeze. Each 500grams is used for a meal – spaghetti bolognaise, nachos, meatballs mash and veg, burgers. Rib stewing is good for potjie. We make it once a month during winter. Salami packs are great for quick lunches and pizza toppings. Venison sliced biltong, it’s a WIN, gonna try order more and keep half frozen next time I think but very happy with it so far! Desiccated coconut, amazing price, great for crunchies! Nu Eco dishwashing liquid, works brilliantly, I’ve tried a few earth friendly and this is by far my fave. Great smell & bubbles, cleans excellently & MGFC price is fab! Natural deo works really well. Treat: I love white choc covered hazel nuts. Combine well, spoon into greased baking tray. Oven 180 for 15 – 20min. When remove from oven immediately divide into blocks with spatula in tray, leave to cool in tray. I know what you’re thinking… most delicious homemade christmas gift, you were thinking of my fudge recipe were you not? Well, you were close, but this year, I branched out and decided to make something savoury (ish – depending on if adding 1/4 cup of sugar to anything can be considered savoury). We try in our family, to include the homemade element over Christmas, for personal and somewhat anti-consumerism-Christmassy reasons – so I’m super pumped to have this all made up, in my fridge and ready to throw on a cheese plate. Red Onion Marmalade. Yum guys. Yum. This pressie has been made and has been/will be distributed to parents, in-laws and teachers alike. And it’s easy and so very, very delicious. Tip: Genius Debbie remembered she had a slicing attachment on her food processor, and so no onion-tears for me. Boom. Heat olive oil and butter in a large skillet over medium heat; cook and stir onions and sugar in hot oil until onions start to caramelize, about 15 minutes. Stir red wine and balsamic vinegar into onion mixture and bring to a boil. Reduce heat to medium-low and simmer until liquid is evaporated, 15 to 20 minutes more. Season with salt. All you need are some jars (I get mine from Bonpak), and some brown paper (PNA/MerryPak) and some twine/string. 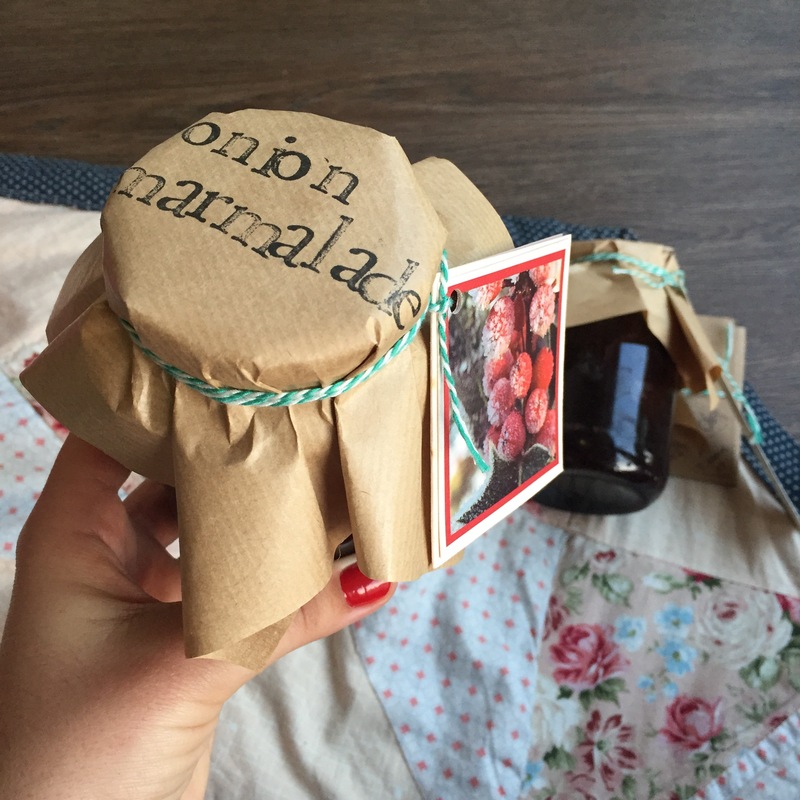 I attached a little card with a note and onion marmalade ingredients. How cute, and HOW simple? What is your fave homemade treat?